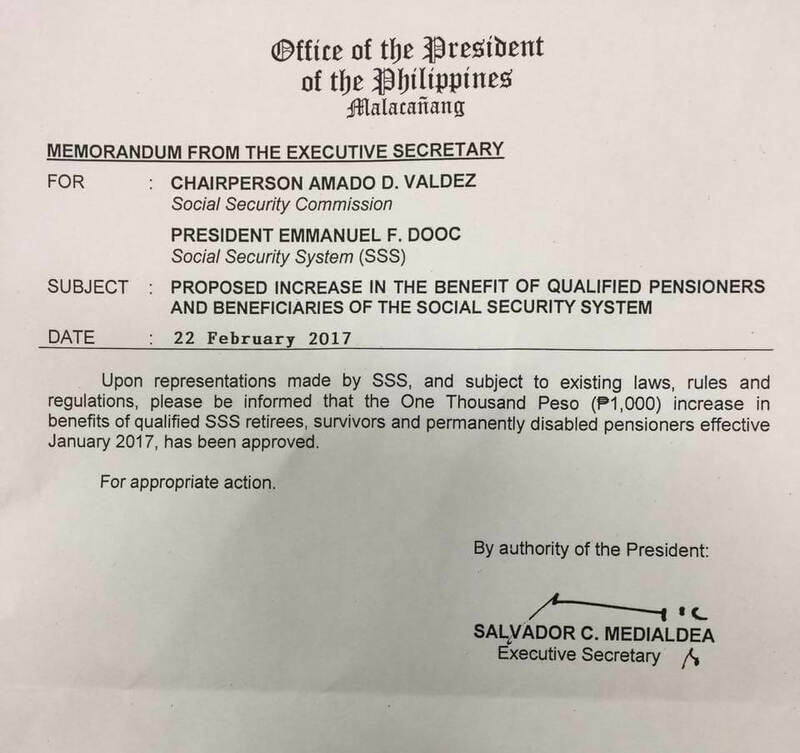 Here’s the news for all SSS (Social Security System) pensioners, our President Rodrigo Duterte signed and confirmed additional 1,000 pesos benefit. The pension increase for the first 3-months of this year will be received on March 3, 10 and 17 2017. For the following, the added amount will be automatically included in regular monthly pension. This covers all qualified SSS retirees, survivors and permanently disabled members effective January 2017. 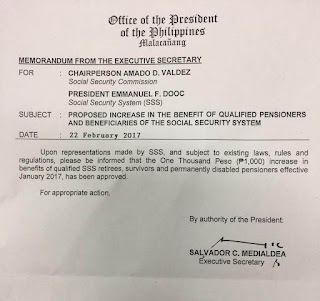 “The P1, 000 benefit increase will be received by our pensioners in three distinct payments at three different dates for the months of January, February and March,” Dooc said during the Social Security Commission Board meeting. “We would like to thank the Office of President Duterte for the support on this issue. To our pensioners and members, thank you for your patience and this is just the first good news that will come from me. There are more to come,” Valdez said. “This is a concerted effort. The administration really wanted to improve the level of living of the Filipino people. Those who have less in financial aspect will have more in this pension hike. We have a new inspiration to work for more after this success,” he added. Glad to hear this good news, hopefully they will not increase the monthly contributions of their current active members. If you’re not yet a current member who wants to get updated via online portal, see SSS Online registration. You can also visit your nearest SSS branch of office for assistance and queries regarding online application and registration. (Sources: SSS, SSSPh).